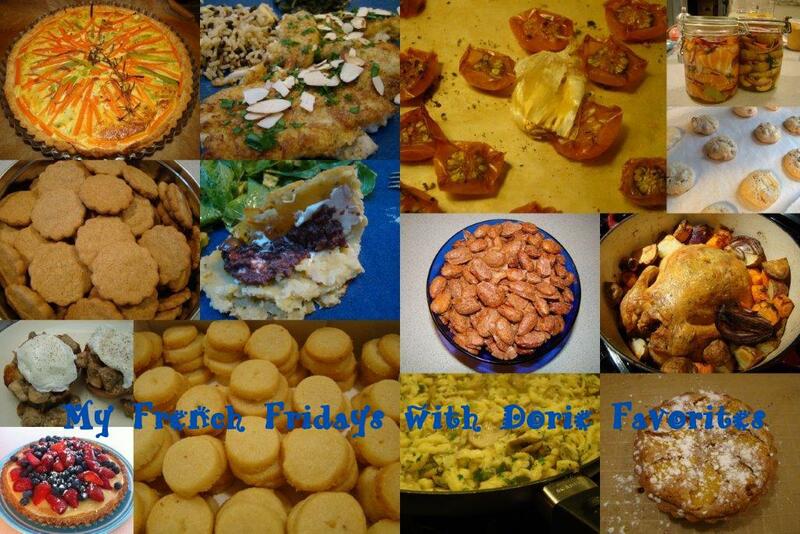 Posted on 29 May 2015, in French Fridays with Dorie and tagged French Fridays with Dorie. Bookmark the permalink. 23 Comments. they were all so good. I love the lazy person’s chicken the bread is brilliant. I can’t believe I forgot about flounder. That was my first recipe. I always wanted to make it again, but my daughter can’t have nuts. I did make her one without it.. Love the galette with berries too… great selection. Great list Betsy! Some of my favorites too. I haven’t yet made the cheez-it-ish crackers but I hope to get them done in the next few days. I agree with most of your favorites and 2nd favorites except salmon in a jar:) I cannot like that! Take care Betsy! Great list! I mentioned a few other recipes in my post as well … it’s just so hard to limit oneself to a Top 5. Great post! I love how you slipped in way more than 5 ;) SO many of my own favourites there too! Love your list, Betsy! The Chicken les Paressesx, definetly one of my favorites. However, I didn’t even make the Salmon in a Jar…I have an aversion to raw fish. Yet, I loved the Gravlax, and was so impressed that I could cure it myself! Something I would do again! The Croquants were wonderful, weren’t they? I make Speculoos every holiday season…love Dorie’s recipe. Happy weekend, Betsy! I will always be following you, even if we don’t cook in the same group! My goodness! You were very thorough with your recap. I’m a little sad about missing some of your favorites along the four year run but happy to be back to cheer on you troopers during the victory lap. 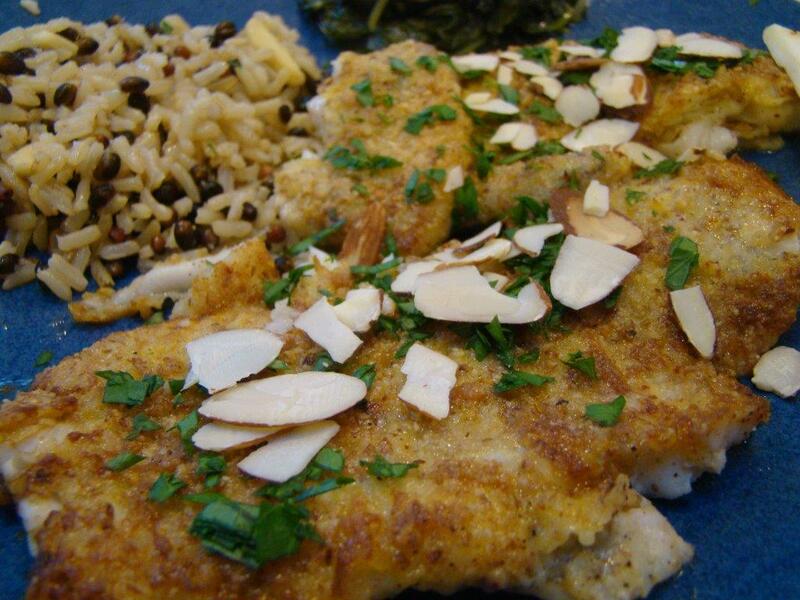 The almond fish meunier should have made my Top 5 because it is definitely a technique I go back to often with white fish and even chicken. 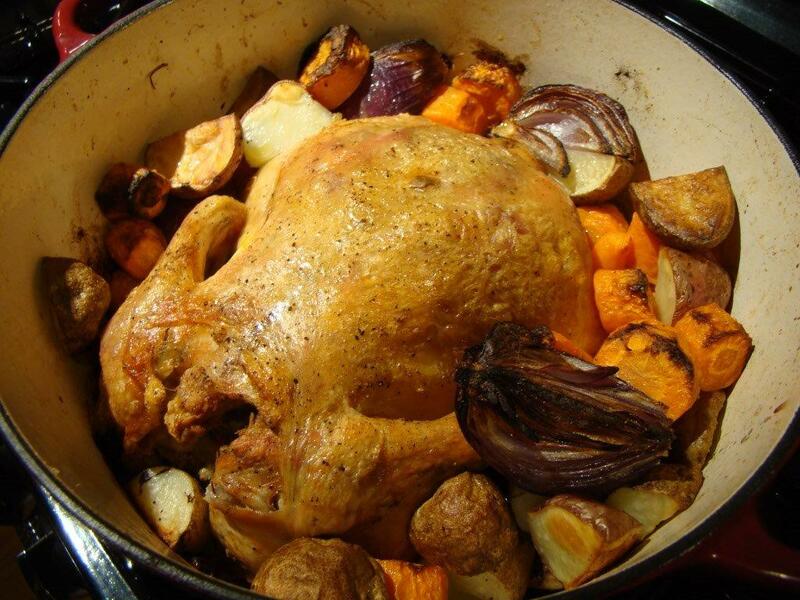 No matter how many chickens we have cooked, in a pot or otherwise, I keep going back to the Roast Chicken for Les Paresseux as one of the best. Great list! Betsy I love all the time and attention you put into your post. Having your opinions about so many recipes helps me out on deciding what to make in the future. The almond flounder almost made my list. 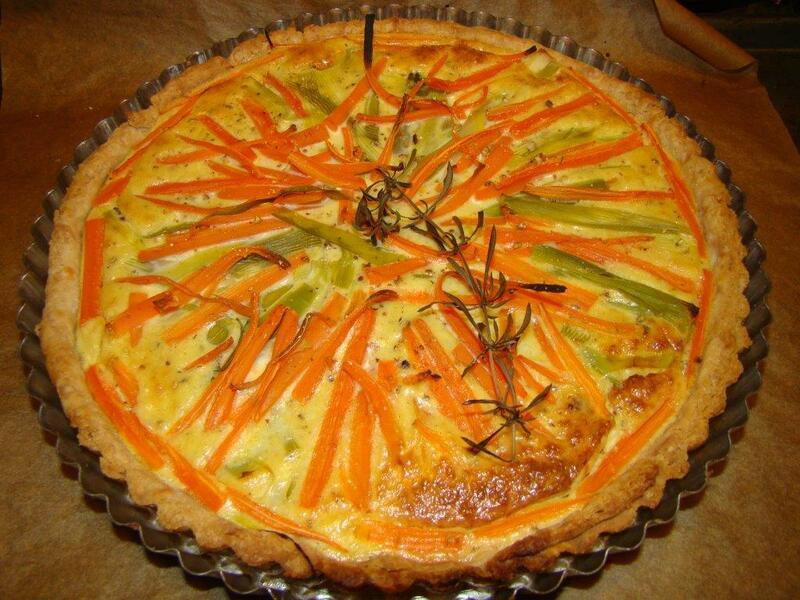 I should make that tart now that it is summer. We share many of the same favourites, Betsy. If I roasted chickens more often (hard to justify when it’s only for me), the Lazy Chicken would have been one of my top picks, too. And so many of the desserts almost made it on my list – croquants being one that I make almost any time I have leftover egg whites. Betsy, Betsy! So many great favorites. I’m glad that you added your other lists. I agree with your basic premise. My list had no recipes that hadn’t been repeated too. That flounder was on my short list. and I’m sure I’ll be mentioning the tart one of these days! I never did get the trick right with bread/chicken – maybe I need to try again! But it’s certainly worthy of a top-five list! So much fun to see what everyone is posting!! A great list Betsy, and your Picasa collage looks terrific. I was bad – I just linked to my old post rather than putting up the photos again. 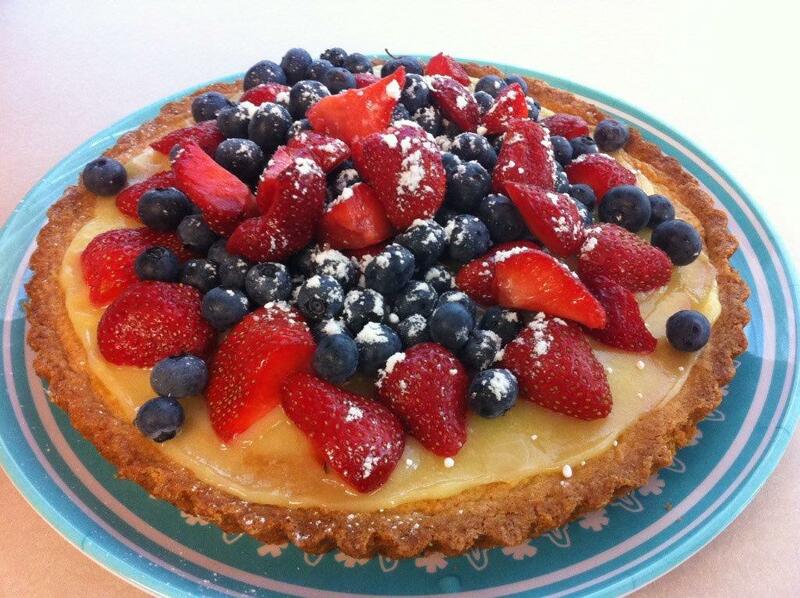 Your fruity custard tart has me in raptures – I really, really want to eat it right now. Great choices! If I had used your criteria for my top 5, I would have a very different list. But we all had to figure out how to narrow it down some way, didn’t we? I liked the salmon in a jar too! It’s funny, I have already made or planned more than one dish that I was reminded of during my review of all the recipes. I am going to have to learn how to start using the recipes from the book, rather than just focus on my weekly assignment. WOW, great list! I loved making the slow roasted tomatoes! :) Remember all the trepidation with salmon in a jar? Those came back to back, way back when – LOL! I love how you made your lists, it’s really not as easy to make a top five as one would think when you have over 300 excellent recipes to choose from! And each of them has a special story for each of us! Oh I love all aspects of this post. Your criteria for what made it to the top five makes a lot of sense- no one hit wonders and both of you must like it. Well done. Loved reading the insights to each, plus the honorable mentions. In all honesty my favorite part was the least favorites- it was fabulous to read your reaction to these and the potential “salmon in a jar” award :) I never would have believed that you don’t like peanut butter on bread and I almost spit out my coffee when reading the Ispahan cake was too flowery and pink. Yes, yes it was. Great post ~ PS thanks for the great card- loved it !! Oh, Betsy, what a wonderful and thoughtful post. Do you know the recipe that I had the most trouble with – you do know, I’m sure. 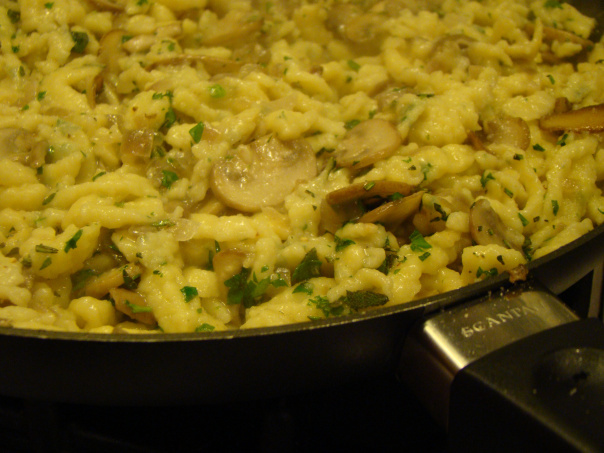 I almost threw in the towel trying to make it – Herb-Speckled Spaetzle. I just cannot make myself go back and try that recipe again. Also, I happened to have loved the Nutella Tartine. I remember making it on Super Bowl Sunday and buying a loaf of brioche that cost $9. I didn’t leave a crumb. I’m with you on the others, both the thumbs up and thumbs down. I really, really loved the Speculoos. That’s my kind of cookie Lovely post, Betsy. Well done. I really like the collage! It was a wonderful journey & we’re so glad to have made it with you! What a fun post! I love that you listed your least favorites as well. Filling the entire pot with bread before adding the chicken is pure genius. That recipe is one of my favorites too, and I’m definitely going to follow your lead next time I make it. It was quite a trip down memory lane trying to narrow down some favorites. Quite a few from both your favorites list and your least favorites list made it onto my favorites list:-) I’m really enjoying seeing where our group comes together and diverges on this little excercise and I like your criteria for picking a favorite. And I think that we might have been the only two who liked the salmon in a jar.